There are some brilliant and unusual ideas for planting out there and we wanted to share a couple that caught our eye. 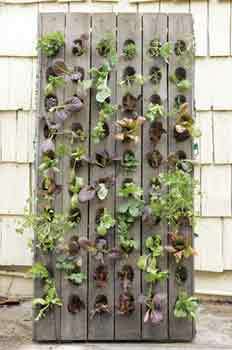 This vertical plant wall was created by Anne Phillips in America and was featured in the Los Angeles Times. She has made a wonderful salad garden that would work work well in a small space or a patio/deck area, and really is great feature as well as being yummy to eat! 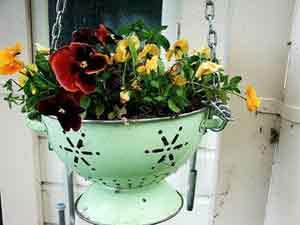 What about another bit of upcycling by using an enamel colander as a hanging basket? Great pic from Swoon Worthy‘s blog. So don’t be afraid to experiment and recycle other items as planters, and most of all have fun with your planting!